This session has been waiting to be published for a couple of months and I could not be more excited to share it with you. I had the pleasure of filming Chatham County Line from Rayleigh, North Carolina. To celebrate the release of their seventh studio album Autumn, here’s the session we filmed in LantarenVenster, Rotterdam earlier this year. Expect bluegrass of the highest quality and performances that are infectiously fun. I am very happy that I stuck around after the session to watch them play live that night. Rarely have I seen an acoustic show that entertained the entire audience for that long. They showed true showmanship, plus they have the skills to back it up. I remember sending a message to a friend that night saying it’s like listening to bluegrass versions of The Band songs. 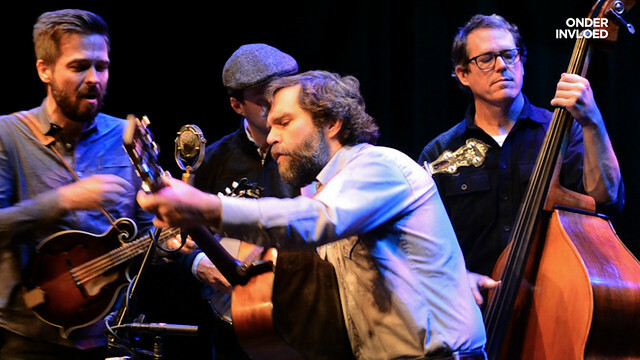 The great thing about Chatham County Line is that they combine the typical bluegrass sound with a more traditional element and an impeccable songwriting talent. Everything about this band just seems to work. (…) We have never strived to be anything other than genuine in what we do. It’s a good feeling when so many appreciate what we have worked so long and hard to achieve. Earlier this year the band – who’ve had the flag of North Carolina hanging on stage during every show for 16 years – took down the flag in protest of the ridiculous HB2 law, stating: “Heartbreaking, but this comes down until #HB2 does.” It resulted in a lot of short sighted, sometimes questionable messages on social media which is pretty stupid, because there aren’t many bands that I’ve met who are as proud and speak so fondly of their hometown as Chatham County Line. But, getting back to the music: It’s really good that with Autumn there now is a successor to Tightrope, as that record has been played A LOT over here in the Onder Invloed office. You try watching them play Should Have Known and not end up singing it to yourself for days to come. Just try it. See? I told you. LantarenVenster in Rotterdam, The Netherlands.